"While doin' time in Apple Tree Creek I found myself cooking without a stove! Thank the heavens for slow cookers and electric frypans! Serve topped with a bit of shredded Cheddar cheese and cooked, crumbled veggie bacon. 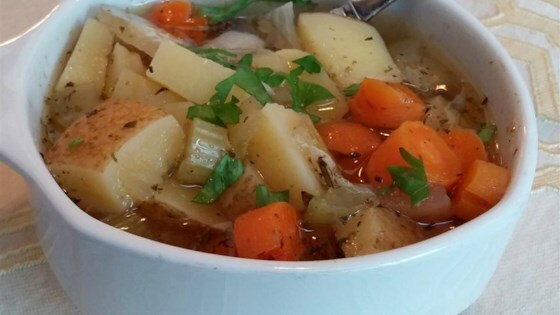 Bannock made in an electric frypan is a nice accompaniment to this soup." Drizzle olive oil into a slow cooker. Add potatoes, onion, celery, carrot, and garlic; cover with water. Stir in vegetable stock powder until dissolved. Season with salt, sage, thyme, bay leaves, and pepper. Cover and cook on High until potatoes are soft, about 6 hours. This may be the simplest potato soup ever. I added some red pepper flakes, a can of cream of mushroom soup, two cans of water, 32oz of vegetable broth...so yummy! A little salty. I'll cut down on the quantity the next time. The soup had a very good flavor and was pretty easy to assemble. I used little gold and purple potatoes and shredded carrot instead. Added the cream of mushroom like someone else suggested. V good.